Best Airlines to Travel Around the World in terms of various factors such as passenger capacity, destinations, fare and services is depicted here. Best Airlines list from top to bottom which really makes a difference. Qatar is the best among all the airline in the world travelling along 140 destination. Then coming after are Turkish, British, Emirates, Singapore, Etihad, Lufthansa, Cathay Pacific, Air New Zealand, Air France, Air India. Qatar Airways founded in 20 November 1993 and operations started on 20 January 1994. The airline operates over 140 international destinations across Africa, Central Asia, Europe, Far East, South Asia, Middle East, North America, South America and Oceania from its base at Hamad International Airport, using a fleet of more than 150 aircraft. Best Airlines and Voted Airline of the Year by Skytrax in 2011, 2012 and most recently in 2015. British Airways founded in 31 March 1974. British Airways serves over 160 destinations, including six domestic. 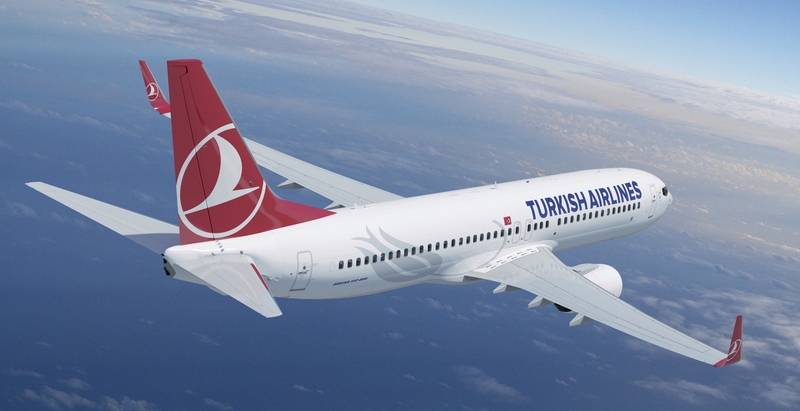 It is one of the few airlines to fly to all six permanently inhabited continents. British Airways the largest airline in the United Kingdom based on fleet size. British Airways is a full service global airline, offering year-round low fares with an extensive global route network flying to and from centrally-located airports. Etihad Airways was founded in 2003. The airline operates more than 1,000 flights per week to over 120 passenger and cargo destinations in the Middle East, Africa, Europe, Asia, Australia and the Americas. Etihad Airways is the third largest airline in the Middle East and it is the second largest airline in the UAE. Cathay Pacific Airlines was founded in 24 September 1946. 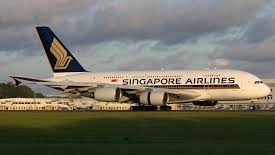 The airline’s operations include scheduled passenger and cargo services to 200 destinations in 52 countries worldwide. Cathay Pacific was awarded Skytrax’s 2014 Airline of the Year. Cathay Pacific has won the “World’s Best Airline” award four times, more than any other airline. Air New Zealand Airline was founded in 26 April 1940. Air New Zealand Airline operates flights to 22 domestic and 29 international destinations in 16 countries. The airline has been a member of the Star Alliance since 1999. Air New Zealand’s route network focuses on Australasia and the South Pacific, with long-haul services to eastern Asia, the Americas and the United Kingdom. Air France was founded in 7 October 1933. Air France serves 36 destinations in France and operates worldwide scheduled passenger and cargo services to 168 destinations in 93 countries. Air France ranked as the largest airline in the world in terms of operating revenue. During the Cold War, from 1950 until 1990, it was one of the three main Allied scheduled airlines operating in Germany. Air India was founded in October 1932. Air India is the best airlines in India in terms of passengers carried. It operates 109 fleet with 82 destinations around the world. It is owned by Air India Limited, a Government of India enterprise and operates a fleet of Airbus and Boeing aircraft serving various domestic and international destinations. Air India became the 27th member of Star Alliance on 11 July 2014.
on post-based roster as per the prevailing cadre strength. 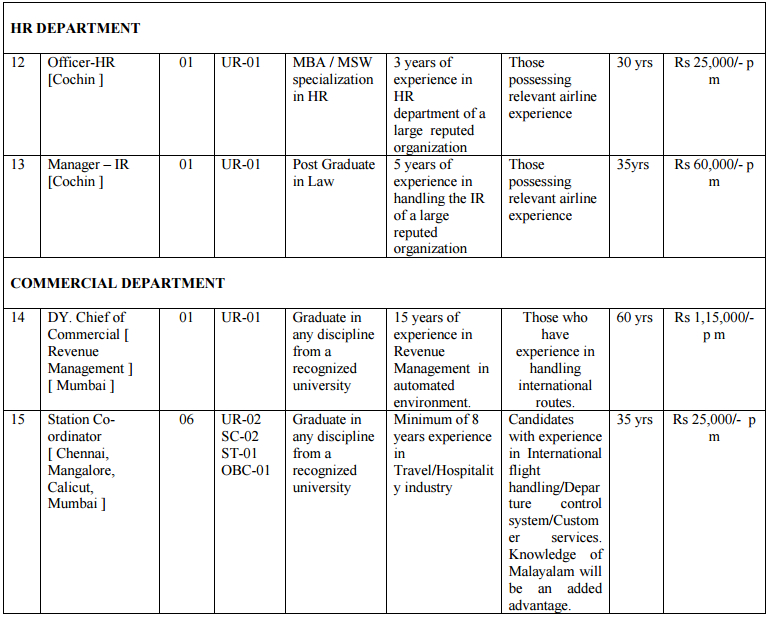 Application Form for Air India Express Recruitment 2015 is available for various post. Candidate can check all the details and apply according to their eligibility and Interest. Candidate has to apply by Offline mode only. Candidates belonging to General & OBC categories will be required to submit a non-refundable Fee of Rs.500/- in the form of Demand Draft drawn in favour of Air India Charters Limited, payable at Mumbai, along with their Application. Note : SC / ST / Ex-Serviceman candidates are exempted from payment of this Fee ). Self-Attested copies of supportive documents in respect of Educational Qualifications, Age and Experience, must be submitted along with the Application in the prescribed format, accompanied with 02 recent (not more than 6 months old) passport sized coloured photographs–matt finish paper with light background, with the name on the reverse of the photographs. Original certificates are required to be brought along, at the time of appearing for the Selection Process, for verification purpose only, but should not be submitted / attached along with the Application. The Company is not responsible for returning any original copy/ies of certificates / testimonials submitted with the application. eligible candidates only, will be called for the selection procedure. Candidates will have to bear the cost of the Pre-Employment Medical Examination(s), which could range between Rs.500/- and Rs.1, 000/-. Any additional tests, if required, the additional cost thereof will also have to be borne by the candidate. Shortlisted candidates will be inducted as per vacancies and Reservation requirements, subject to being found FIT in the PEME. Period of Contract: Selected candidates will be appointed on fixed-term contract basis for a period of 05 years. The contract could be terminated at the discretion of the Management during the tenure of contract, and / or in the event of unsatisfactory performance or Company requirements. Engagement beyond the period of contract will depend on the Company’s requirement / Employees performance. The candidates will be positioned at any city on the network as per the Company requirement. The candidates will have to make their own arrangement for housing accommodation. The Company, at its discretion, may assign additional duties, as and when required. Consideration and Relaxation of SC/ST/OBC candidates will be as per Government directives on reservation of posts. Based on requirements, the incumbents are also likely to be deployed to the parent company / Group / AICL affiliate sister concern / subsidiary, anywhere in India or abroad. (Relaxation of 2.5 cms (1”) for SC/ST candidates and those hailing from North-East States & hilly areas. This relaxation will be granted to candidates who produce a Certificate of Domicile of this area). Near Vision N/5 in a better eye and N/6 in worst eye. Distant vision 6/6 in one eye and 6/9 in another eye. Contact lenses up to +2D permitted. Colour vision should be normal on Ishihara Chart. Should be well groomed with Clear complexion without any noticeable blemish, no odd scars / birth marks. Clear speech, no stammering, lisping. Command of the English/Hindi language should be with clear understandable accent. Applicants who have three years’ Degree/Diploma Holder in Hotel Management and Catering Technology from a Government recognized Institute. 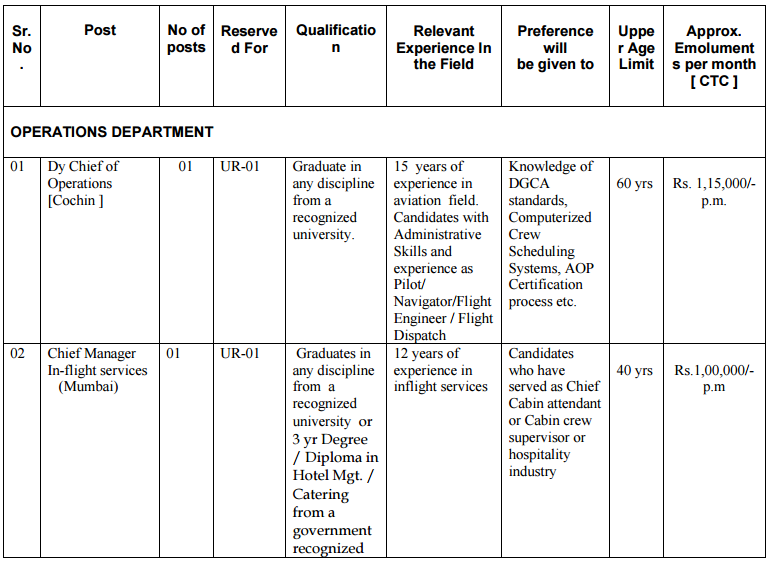 Applicants who have flying experience as Cabin Crew. Applicants who have successfully undergone a Course in First Aid. Applicants must be well groomed and have a clear complexion. They should be dynamic and have a friendly hospitable disposition, with pleasing gestures. A Medical Certificate from a MBBS Doctor details with regard to Physical Standards, Doctor’s name and Registration Number of the Doctor will be required while filling the Online Application Form. A non-refundable Demand Draft for Rs.500/- (Rupees Five Hundred only) in favour of AIR INDIA CHARTERS LIMITED, payable at MUMBAI DD should be issued only from a nationalized bank. Candidates will have to bear the cost of the Pre-Employment Medical Examination(s), which could range between Rs.500/- and Rs.1000/. Any additional tests, ifrequired, the additional cost thereof will also have to be borne by the candidate. 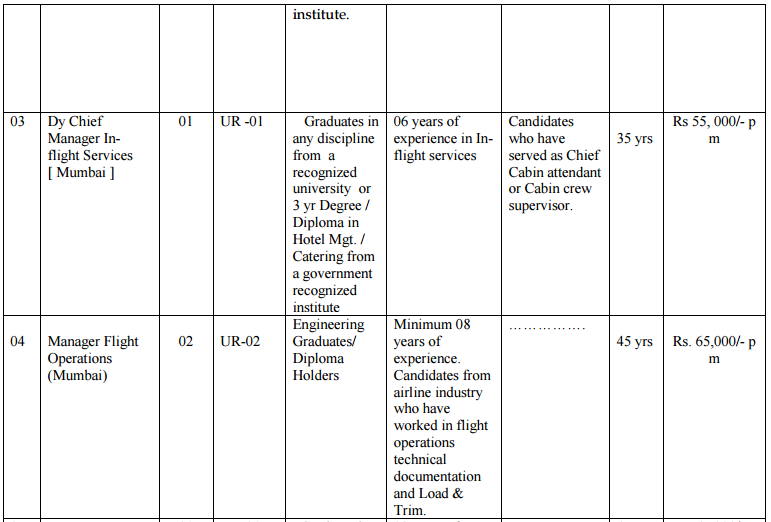 Air India Limited is looking for bright and energetic Indian National young boys and girls to join as Trainee Cabin Crew for its immediate following requirement in Northern, Western, Eastern and Southern Regions on a fixed term engagement, for an initial period of five years and to maintain a wait list for future requirements. Candidates who apply for Southern Region may be posted at Chennai, Bangalore, Hyderabad and Calicut depending upon the requirement. 10+2 from a recognized Board/University Candidates who are three years’ Degree/Diploma Holder in Hotel Management and Catering Technology from a Government recognized Institute will be given preference. Between 18 and 27 years (Relaxable upto 5 years in case of SC/ST and 3 years in case of OBC categories). Female – Minimum 160 cms. Male – Minimum 172 cms. 3. Colour Vision (Colour Blindness): Normal on Ishihara/Tokyo Medical College Chart. Candidates having fluency in any Foreign Language of destination where Air India operates will be given preference. Interested candidates, who fulfill the above requirements, may apply ONLINE (ONLY). Candidates who wish to apply, are advised to log on to Career Page of Air India Website: www.airindia.in and fill in the Online Application Format. For SC/ST/OBC candidates only- Caste Certificate details – such as date of issuance and issuing authority. Candidates, who fulfill the above eligibility criteria and are employed in Government/Semi Government/Public Sector Undertakings, may also apply Online. Such candidates will be required to bring a “No Objection Certificate” from their employer at the time of appearing for GD & PAT. Eligible candidates would be required to go through a Group Dynamics & Personality Assessment Test (GD & PAT) at the venues as decided by Air India Limited. GD & PAT shall be conducted in phases and candidates who qualify the same and fall in the applicable zone of consideration, will appear for a Written Test. Eligible Female candidates will be required to appear for GD & PAT in “SAREE” and male candidates in formal attire. At the time of GD & PAT, candidates w i l l be required to bring two POST-CARD size FULL LENGTH photographs (One-Front View and another-Side View). The dress code prescribed for these photographs is SAREE for Female candidates and formal attire for Male candidates. Training: Selected candidates will be imparted training at Hyderabad/Mumbai or at any other place decided by the Company and will be required to obtain necessary DGCA approval on Air India Ltd’s fleet as decided by the Management from time to time. Period of Fixed Term Engagement: Candidates will be engaged on a Fixed Term contract initially for a period of five years, which is extendable subject to performance of the candidate and the Company’s requirement. Emoluments: During the period of training, the candidates will be given a stipend of Rs.15,000/- per month. After successful completion of the training, candidates may initially draw Rs.35,075/- per month. 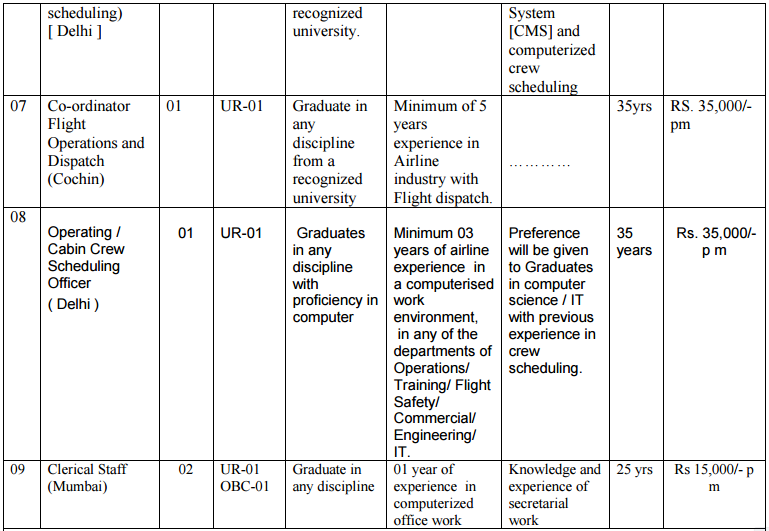 The above salary includes Fixed pay of Rs.16,675/- and Rs.18400/- as Flying Allowance for 70 hours of flying in a month. In addition to above, candidates will also be eligible for Standby Allowance of Rs.300/- per Standby Duty at the Airport. Candidates will also be eligible for payment of Layover Allowance @ USD 45 per day for International Flights where Night Stay is involved, as per rules.